Does it bother you if the sign says "or less?" Or do you think the fans of "or fewer" are fussbudgets? This week's "Word Matters" conversation with Weekend Edition host Scott Simon explores the "less vs. fewer" debate. We also discuss the Christmas-time crush of holiday cliches. Editors at NPR and other news organizations tell correspondents to go easy on the "jing-a-ling-lings" and the "ho-ho-hos," but seem to lose that battle every year. On a much more serious note, we talk about a key word that comes up in stories about the death of Eric Garner — the Staten Island man who died after being put in a chokehold and restrained during an arrest by New York City police. Our dictionaries tells us that the word — chokehold — describes what happened. Some listeners and commentators have questioned whether chokehold is the right word to use. Like other news outlets, NPR is going with the dictionary definition. But let's get back to those checkout signs and the "less vs. fewer" discussion. We asked during the last "Word Matters" conversation for listeners to email wordmatters@npr.org about the misused words or phrases that bother them the most. We heard from several about those express lane signs. The topic even divided this correspondent's family. There were the descriptivists, who argued that "or less" has become common, isn't confusing and therefore is fine. There were the prescriptivists, who argued that "fewer" is to be used when objects such as grocery items can be counted, while "less" is to be used when referring to mass amounts. -- 59.4 percent agreed that a sign saying "10 items or less" is something "only the fussiest of fussbudgets would worry about." William Safire, the "On Language" columnist for The New York Times, came down firmly against signs that say "or less." In 1988, he cheered when Safeway Stores joined the "or fewer" side. 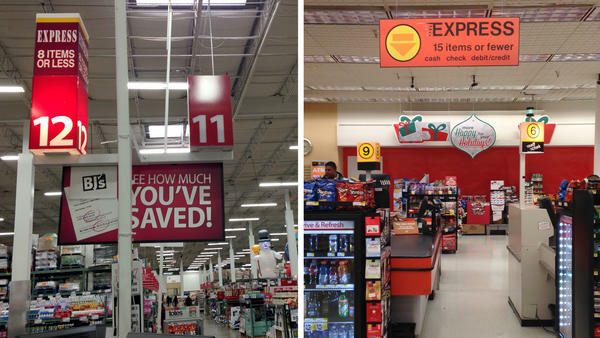 "The most power-intensive moment in the history of this column came when Safeway Stores was criticized here for 'Express Lane — Ten Items or Less' and promptly rectified the mistake," Safire wrote. It's hard to argue against the legendary Safire (who died in 2009). "When asked to join in a 'let's persuade this supermarket chain to get rid of their 5 items or less sign,' I never join in. Yes, I am aware of the technical distinction between less and fewer and between uninterested and disinterested and infer and imply and all the rest of them. But none of these are of importance to me. None of these are ... of importance I said there, you'll notice. The old pedantic me would have insisted on 'none of them is' of importance. But i'm glad to say I've outgrown that silly approach to language." Signs that say "or less": Egregious error or a silly subject? The wordmatters@npr.org inbox is open and ready to hear more about that and other grammatical gripes. In fact, we would welcome nominations for "most misused word or phrase of the year." We'll report on the results in an upcoming "Word Matters" conversation with Scott Simon. That crooning from Weird Al means Word Matters - our occasional look at the reasons we use the language that we do. Back with us, NPR's resident grammarian and usage expert Mark Memmott. Mark, thanks for being back with us. SIMON: 'Tis the season to deck the halls with holiday analogies. Do you like these cliches anymore than you care for figgy pudding? MEMMOTT: Scott, I say bah humbug to the news media's annual insistence on slipping those cliches into so many stories. MEMMOTT: We get it. Christmas is coming, so is Hanukkah. New Year's Eve is fast approaching, but that doesn't mean we have to constantly hear 'twas the night before or that the weather outside is frightful or that it's beginning to look a lot like anything. I love the holidays. There's room for a clever play on the language of the season. Maybe you can figure out a way to do something fresh with "12 Days Of Christmas," but let's not add to the holiday fatigue. SIMON: Very serious editorial language question in the news this week - how does NPR refer to what happened to Eric Garner, the man who died in New York City after being restrained by New York police? MEMMOTT: Yes, there's been some pushback from some in the public about whether the news media should be saying that the officer used a chokehold. We - and most other news outlets - have been using that word. Here's the issue - officers are supposed to be trained not to use a hold that restricts someone's breathing. They're taught to use other methods, including a hold that can make a person pass out by restricting blood flow to the brain, but does not cut off air to the lungs. Saying it was a chokehold then is akin to saying the officer wasn't following the NYPD's own procedures. MEMMOTT: It is a judgment call and there are some who say that because you could hear Mr. Garner - or Eric Garner - speaking, he was saying I can't breathe. I can't breathe. He was getting some air - some air into his lungs. So therefore you probably shouldn't call it a chokehold. But if you go to the dictionary and look up the word you find this definition - a technique for restraining or subduing a person by locking one's arms around the person's neck - so the word applies. SIMON: You've asked listeners to write in with words that particularly annoy them - wonder what words or phrases have come your way. MEMMOTT: The very first email we got from Jeanne Rouleau(ph) in Stoughton, Massachusetts, was about the phrase ahead of. Why not just say before, she asked, adding that it drives her crazy. Brad Bauer(ph) of McKinney, Texas, hates the word incentivize. Those who use it should be incented to stop, he joked. An issue that sparked a lot of discussion and some spirited arguments within my family was about checkout signs that say 10 items or less instead of 10 items or fewer. The prescriptivists - I love that word - are sure it should be 10 items or fewer. They were taught in school that fewer is the word to use when things can be counted. The descriptivists - and you know who you are out there - say language is a living thing and that when it comes time to talk and speak we can go with what's become common, especially when there's no confusion about the meaning. They are not perplexed by 10 items or less. SIMON: And as we approach the end of the year, you've asked listeners to send you their nominee for the most misused word of the year. SIMON: Most misused word of the year, I guess, on our air is kind of what we mean. SIMON: As a verb, right? MEMMOTT: As a verb. I know there are many out there who argue it's perfectly all right to use it as a verb. To my ear, it's still better as a noun. Instead of saying how will the Bears's latest loss impact Coach Mark Trestman's future with the team, how about just asking how will it affect Trestman's future? And I think you know the answer to that question. MEMMOTT: But I'm sure listeners will have other nominees for most mangled word or phrase of the year and we'd like to hear them. SIMON: Mark Memmott is NPR supervising senior editor for standards and practices. Much like - forgive me - a Santa cliche, he's waiting for your letters at Word Matters at npr.org. Mark, thanks very much for being with us. YANKOVIC: (Singing) Your prose is dopey, think you should only write in emoji. Oh, you're a lost cause, go back to pre-school. Transcript provided by NPR, Copyright NPR.